Mecca Bursts the Bingo Bubble | Win a 3D TV & more! 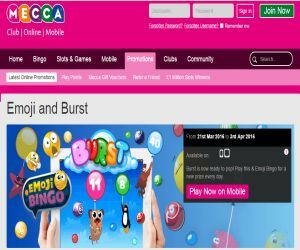 Mecca Bingo has unleashed it's brand new Bingo Burst mobile game and it's ready to explode with sugar-coated rewards! So join the celebrations and play to win a different party-popping prize each day from a 3D TV to shopping vouchers! The brand new bingo sensation is bursting with fun and full to the brim with an adorable set of cute balloon animals instead of bingo numbers! As soon as each animal is called out they spectacularly burst, and dramatically fall out of the sky, until you're left with a Full house! Each quick-fire game will be unleashed every 2 minutes from 9am to 12am daily. The games are also multi-stake, which means you'll have the chance to select your stake. As an added perk, you'll also have the chance to collect more prizes at the reels with XTG games! Not only can you have fun playing with the new sensational releases, Mecca Bingo is celebrating with a whole host of party-popping daily promotions! If you head to Mecca from now until April 3rd, you can join the celebrations with a different promotion each day! To join the fun, simply play Burst Bingo and the new Emoji Bingo, to uncover a prize each day, from an iphone 6 to £250 Amazon Vouchers, 3D TVs, a £200 Love2 Shop Voucher and a £100 Hungry House/Just Eat Voucher! The 31st March is Burst XTG Day, which means that every second game playing in the Burst Bingo room will be XTG, meaning they'll be even more winning chances. From 1st to 3rd April, you can top up your account with just £5 cash to play Emoji Bingo and Burst Bingo, to go into a daily prize draw. Each day you can scoop a different winning prize, including a 3D TV on 1st April, an iPhone 6 on 2nd April, a £250 Amazon Voucher on 3rd April, a £250 Amazon Voucher on 3rd April, a £200 Love2Shop Voucher on 4th April and a £100 Hungry House/Just Eat Voucher on 5th April! You can play these party popping games on your mobile or tablet on the go, so you'll have more than enough chances to celebrate with Mecca!